THRIVE™ Asparagus will add distinct flavor and color to all your casseroles, soups, salads, and side dishes. Known for its high folic acid, fiber, and vitamin content, asparagus is a healthy choice for any meal. 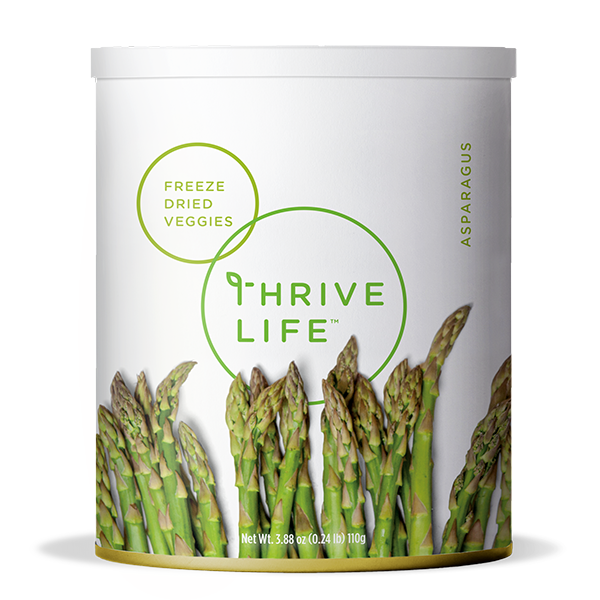 THRIVE Asparagus is already chopped to save you time, and it’s freeze dried so it’s easy to keep on hand to toss into your favorite recipes. Add 1⁄3 cup of water to 1 cup Asparagus; let sit 5-10 minutes or until tender. These pieces include both stalks and tips in bite-sized chunks that add a healthy boost to salads, soups, or pastas. Make it a bit more kid-friendly by pureeing it for soup; they won’t even know they’re eating veggies!